Welcome to the School Nurse Corner! In this page you will find useful notices, resources and reminders from Nurse Little and Nurse Hall. On Wednesday, Jan 16th Wills Eye will be back to continue vision screenings, and doctor visit, for glasses follow up, for grades K to 5 only!! OHIP dental program applications were handed out for FREE dental screenings and some treatments in school, the date TBD. Nurse Little will be offering CPR, AED, and Epilepsy training classes for all teachers and staff; the date will be announced soon. Congrats to all Bache Martin families, we have 95% immunization compliance. Whoot..whoot..Thank you parents and guardians for our Great health compliance!! Let's continue forwarding a well physical for your child. *Please read and refer to the sick letter for colds, flu, and stomach viruses. Please be adviced that students areetting hit with these illnesses. If you have any questions contact Nurse Little or Nurse Hall directly. Cold/Flu season is here! When should I keep my student at home? Please use this handy guide, and let's stay healthy together! DON'T FORGET: Please submit a note for an excused absence! You can download a template by clicking here. 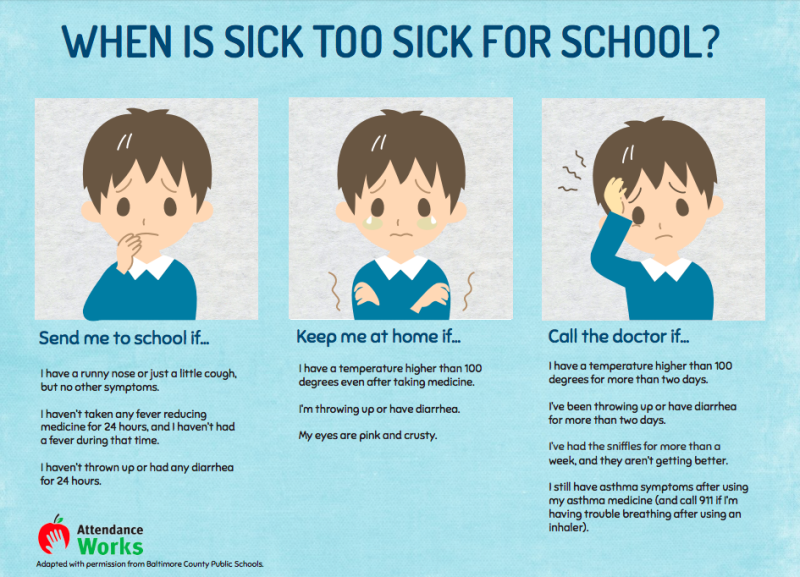 If the student is out for 3 or more days at a time, a doctor’s note is required to excuse absences. You can access your student’s attendance record by creating a parent/family account at philasd.org and signing up for the Parent Portal – let Ms. Cocca know if you’d like any assistance with the parent portal. Students: Don't forget to hand in those notes! If a medication has been prescribed by your child's pediatrician, and needs to be administered, please contact the nurse's office. You will need to fill the Request for Administration of Medication form. Bring this form, along with the medication, to the nurses' office. For additional forms, please go to the Philadelphia School District's Student Health Forms Page. On Sept 24th, Wills Eye is coming to Bache- Martin to provide required vision testing for students in grades 2 to 5. FREE eye checks and eyeglasses for Philadelphia area children 17 years and under, from Philadelphia and surrounding counties, who have not had, or who have not passed, an eye screening and/or who are uninsured. For more information email: [email protected] or call 215-563-5848 x21. If you have a 3rd or 7th grader, we need to have a Dental Checkup before the start of the school year. Please make sure your Student's dentist fills out the Private Dental Examination Form (MEH-155, found below) for us! All Kindergarten and new students must have a copy of updated immunizations, physical and dental submitted prior to registration. All 7th graders are required to receive Tdap and Meningitis vaccines. State immunization requirements changed last year!